Value: Fantastic bang for the buck. I made the proclamation that Buffalo Trace is *THE* bottle of whiskey you should have in your liquor cabinet quite a while ago and have been searching for a contender to that throne. Four Roses “Yellow Label” Bourbon is the first real contender I’ve come across. Straight to my “let’s not mince words” proclamation: Four Roses Yellow is unbelievably smooth! While on vacation in Hawaii, I wanted a utility Bourbon that would make the 4 bourbon drinkers here happy during our time on the island. 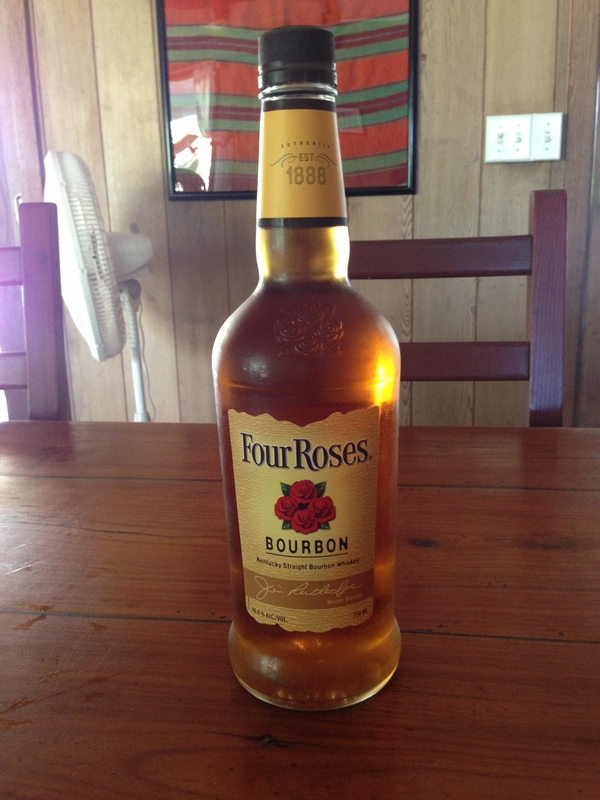 I was pleased to stumble across the least expensive Four Roses Bourbon that the company makes. Here on the islands, it’s overpriced. I know, however, in my mainland stomping grounds that Four Roses Yellow clocks in at the $18 to $21 range. That price sails under what I pay for Buffalo Trace. …yes, my beloved Buffalo Trace, you are in trouble. Four Roses Yellow is unbelievably smooth! The subtle nose and taste twists that Four Roses have managed to slide in are undeniable, appreciated, and for me, expected. The fruit and floral notes on the nose are uniquely “Four Roses.” All three versions of Four Roses I’ve tasted have floral and fruit tastes that I’m guessing are the company’s signature. What’s fantastic for me, is that these notes are perfect for blending in with all of the mixed drinks I make with bourbon. The Chapel Hill leans heavily on the floral notes. The Black Bourbon elevates the floral and the fruit. The Monte Carlo needs the fruit undertones to work with the Benedictine. And don’t get me started on The Beet. It’s the ONLY bourbon I use for that. Honey and brown sugar, toasty oak and spicy vanilla, all dance across your tongue. Smooth and warm: that’s the start and the finish here. Four Roses Yellow behaves like a $35 bottle of bourbon. Four Roses Yellow behaves like a $35 bottle of bourbon. Like that other bourbon I’m hell-bent on comparing this to, this bourbon will change its flavor profile in your mouth if you sip and hold. This is one of the more complex bourbons you’ll encounter, and definitely the most complex you’ll find at this price point. A glass, an ice cube, and Four Roses Yellow make for a peaceful, polite evening cocktail. I really can’t sing the praises enough. In its price point, this is quite possibly the best bourbon you can get. There will be a reckoning… the day approaches when Buffalo Trace and Four Roses Yellow go head to head. …and many more. This is a versatile bourbon that begs to be blended, but holds it own as a single sipper.